In order to avoid possible loss of vehicle control, all seat, head restraint, steering wheel and rear view mirror adjustments, as well as fastening of seat belts, must be done before setting the vehicle in motion. Do not adjust the driver's seat while driving. Adjusting the seat while driving could cause the driver to lose control of the vehicle. Never travel in a moving vehicle with the seat backrest in an excessively reclined position as this can be dangerous. You could slide under the seat belt in a collision. If you slide under it, the seat belt would apply force at the abdomen or neck. This could cause serious or fatal injuries. The seat backrest and seat belts provide the best restraint when the wearer is in a position that is as upright as possible and seat belts are properly positioned on the body. Your seat belt must be adjusted so that you can correctly fasten your seat belt. Observe the following points: - adjust the seat backrest until your arms are slightly angled when holding the steering wheel. - adjust the seat to a comfortable seating position that still allows you to reach the accelerator/brake pedal safely. The position should be as far back as possible with the driver still able to operate the controls properly. - adjust the head restraint so that it is as close to the head as possible and the center of the head restraint supports the back of the head at eye level. - never place hands under the seat or near any moving parts while a seat is being adjusted. Failure to do so could result in an accident and/or serious personal injury. The electrically adjustable seats can be operated at any time. Therefore, do not leave children unattended in the vehicle, or with access to an unlocked vehicle. A child's unsupervised access to a vehicle could result in an accident and/or serious personal injury. According to accident statistics, children are safer when properly restrained in the rear seating positions than in the front seating position. Thus, we strongly recommend that children be placed in the rear seats whenever possible. Regardless of seating position, children 12 years old and under must be seated and properly secured in an appropriately sized infant restraint, toddler restraint, or booster seat recommended for the size and weight of the child. For additional information, see "Children in the vehicle". A child's risk of serious or fatal injuries is significantly increased if the child restraints are not properly secured in the vehicle and/or the child is not properly secured in the child restraint. and the seat heating, observe the following information: - do not spill any liquids on the seats. If liquid is spilled on the seats, dry them as soon as possible. - if the seat covers are damp or wet, do not switch on the seat heating. The seat heating should also not to be used to dry the seats. - clean the seat covers as recommended; see the "Interior care" section. - do not transport heavy loads on the seats. Do not place sharp objects on the seat cushions, e.g. knives, nails or tools. 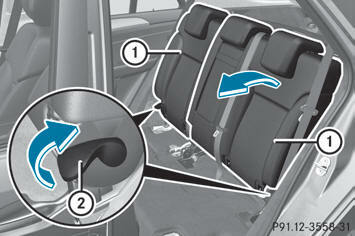 - when the seat heating is in operation, do not cover the seats with insulating materials, e.g. blankets, coats, bags, seat covers, child seats or booster seats. sure that there are no objects in the footwell or behind the seats. Otherwise, you could damage the seats and the objects. folded forwards, the front seats cannot be moved to their rearmost position. You could otherwise damage the seats and the rear bench seat. is folded up before adjusting the backrest and head restraint height. 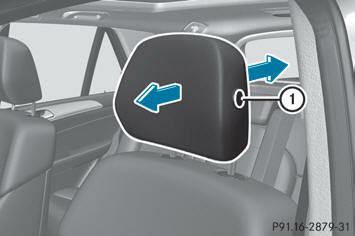 The head restraint and sun visor could otherwise collide when the head restraint is fully extended. head restraints from the front seats. The rearcompartment head restraints can be removed. Please contact an authorized Mercedes- Benz Center for more information. - cargo compartment enlargement (folding the rear bench seat forwards). if PRE-SAFE ® has been triggered, the frontpassenger seat will be moved to a better position if it was previously in an unfavorable position. when the seat is moved forwards or rearwards, the headrest is moved up or down automatically. be removed at a qualified specialist workshop. Mercedes-Benz recommends that you use a Mercedes-Benz Center for this purpose. - To raise: pull the head restraint up to the desired position. - To lower: press release catch 1 in the direction of the arrow and push the head restraint down to the desired position. 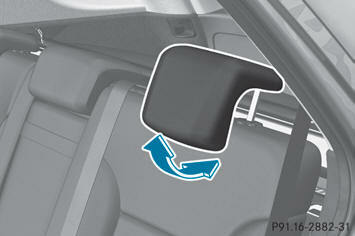 - To adjust forwards: pull the head restraint forwards in the direction of the arrow until it engages. 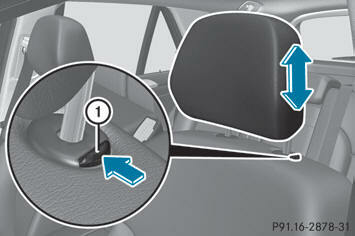 - To adjust rearwards: press and hold the release button 1 and push the head restraint back. - When the head restraint is in the desired position, release the button and make sure that the head restraint is engaged in position. - To adjust the head restraint height: slide the switch for head restraint adjustment up or down in the direction of the arrow. - If the head restraint is fully lowered, it is necessary to press release catch 1. - To lower: press release catch 1 and push the head restraint down until it is in the desired position. Adjust the head restraints so that they are as close as possible to your head. You can only adjust the two outer head restraints. - Using both hands, reach backwards and grasp the sides of the head restraint. - Pull the lower edge of the head restraint forwards or backwards until it is in the desired position. - To remove: pull the head restraint up to the stop. - Press release catch 1 and pull the head restraint out of the guides. - To re-install: insert the head restraint so that the notches on the bar are on the left when viewed in the direction of travel. - Push the head restraint down until you hear it engage in position. - Pull the left or right release lever 2 upwards in the direction of the arrow until the relevant backrest 1 is fully released. 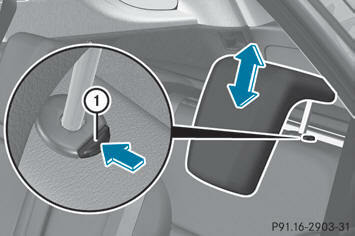 - Pull the backrest 1 forwards in the direction of the arrow and allow it to engage. - Lean back firmly against the backrest 1 to ensure it is engaged. The three red indicator lamps in the button indicate the heating level you have selected. low, the seat heating may switch off. The system automatically switches down from level 3 to level 2 after approximately eight minutes. The system automatically switches down from level 2 to level 1 after approximately ten minutes. 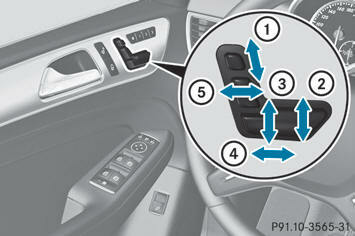 - Make sure that the SmartKey is in position 1 or 2 in the ignition lock. - To switch on: press button 1 repeatedly until the desired heating level is set. - To switch off: press button 1 repeatedly until all the indicator lamps go out. The seat heating has switched off prematurely or cannot be switched on. The vehicle's electrical system voltage is too low because too many electrical consumers are switched on. - Switch off electrical consumers which you do not need, such as the rear window defroster or interior lighting. The three blue indicator lamps in the buttons indicate the ventilation level you have selected. low, the seat ventilation may switch off. - Make sure that the SmartKey is in position 2 in the ignition lock. - To switch on: press button 1 repeatedly until the desired ventilation level is set. and the sliding sunroof using the "Convenience opening" feature. The seat ventilation of the driver's seat automatically switches to the highest level. The seat ventilation has switched off prematurely or cannot be switched on. The vehicle's electrical system voltage is too low because too many electrical consumers are switched on.